FILE- George H.W. Bush, the newly appointed U.S. Ambassador to the United Nations, Dec. 18, 1970. "George H.W. Bush was a man of the highest character and the best dad a son or daughter could ask for," former President George W. Bush said in a statement following the announcement of his father's death. U.S. President Donald Trump and his wife, Melania, praised the 41st president's ability to inspire "generations of his fellow Americans to public service - to be, in his words, 'a thousand points of light' illuminating the greatness, hope and opportunity of America to the world." The Trumps added, "Along with his full life of service to country, we will remember former President Bush for his devotion to family - especially the love of his life, Barbara." Former President Jimmy Carter said he and his wife, Rosalynn, "are deeply saddened by the death of former President George H.W. Bush. His administration was marked by grace, civility, and social conscience. Through his Points of Light initiative and other projects, he espoused a uniquely American volunteer spirit, fostering bipartisan support for citizen service and inspiring millions to embrace community volunteerism as a cherished responsibility." Former President Barack Obama and his wife, Michelle, released a joint statement, saying, "Bush's life is a testament to the notion that public service is a noble, joyous calling." The Obamas recalled that Bush once said he got more of a kick out of being one of the founders of the YMCA in Midland, Texas, in 1952 than almost anything he had ever done. "What a testament to the qualities that make this country great," the Obamas said. "Few Americans have been - or will ever be - able to match President Bush's record of service to the United States and the joy he took every day from it," said Bill and Hillary Clinton, the former president and secretary of state, respectively. They noted Bush's "military service in World War II, to his work in Congress, the United Nations, China, the Central Intelligence Agency, the Vice Presidency and the Presidency, where he worked to move the post-Cold War world toward greater unity, peace, and freedom." 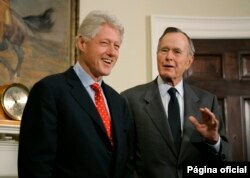 FILE - Former President Bill Clinton laughs as he and former President George H.W. Bush answer questions about their tour of the Asian tsunami region, March 8, 2005, in the White House. ​James Baker, Bush's former secretary of state, said that in each position Bush held, he "led with strength, integrity, compassion and humility - characteristics that define a truly great man and effective leader." John Sununu, who was Bush's chief of staff, wrote in The Washington Post on Saturday, "Although he (Bush) would never be comfortable taking credit for the success of his life, most historians now agree that Bush was a great president who accomplished great things. He helped make America safer and the world more stable and more prosperous than ever before in history." Former Soviet leader Mikhail Gorbachev and Bush worked together to end the Cold War in the late 1980s to early 1990s through such things as U.S.-Russia arms control agreements, including the Strategic Arms Reduction Treaty. He sent condolences to the Bush family, saying they "deeply appreciated the attention, kindness and simplicity typical of George and Barbara Bush, as well as the rest of their large, friendly family." Russian President Vladimir Putin, via the Kremlin website, said Saturday, "A distinguished man has passed away. One who served his country for his entire life, with a weapon in his hands during wartime and in high office during peacetime."